Back in December 2012 I was struck with the urge to create “something big.” Or at least, bigger than the jewelry items I usually make. I also wanted to do something unlike anything I’d done before. 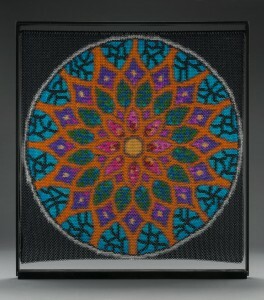 After tossing around many ideas, I settled upon the idea of creating a wall hanging with a colorful inlay. I felt like this piece would really challenge myself and force me to figure out tricks to creating curves and other shapes merely by the juxtaposition of different-colored rings. 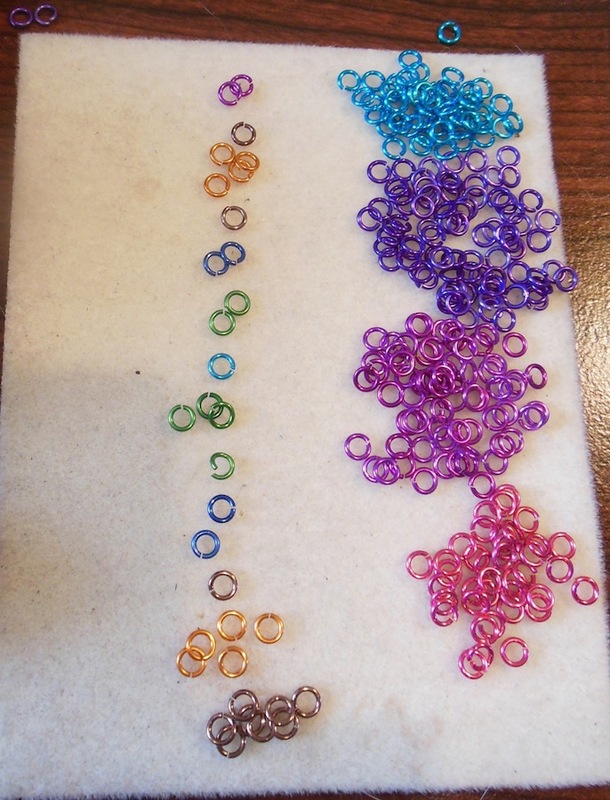 The resulting piece is my Chainmaille Mandala with more than 27,000 jump rings and measuring 23″ x 23″. The frame is custom-made by Mike of Metallic Reptilian Nailmaille. It was spray-painted a glossy black to match the border of the mandala. I’m incredibly pleased with how it turned out, and I look forward to gazing upon it for years to come! Many folks have inquired about the process of making such an inlay, so I’m writing this post to show you what I did, as well as toss out some facts and figures about the piece. 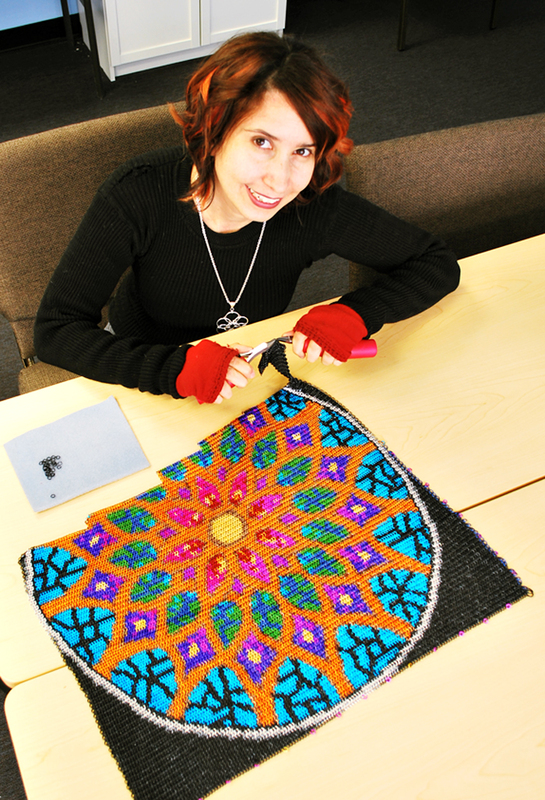 At first I was struck with the wild idea of creating an Oriental rug out of maille…but I realized that I wouldn’t have time to complete it before Bead Dreams 2013, an international competition I hoped to enter. Also, a rug would’ve been huge. And heavy. So I decided to create a mandala instead. The size of my piece was determined by the contest size limitations, which had a maximum width of 24 inches. 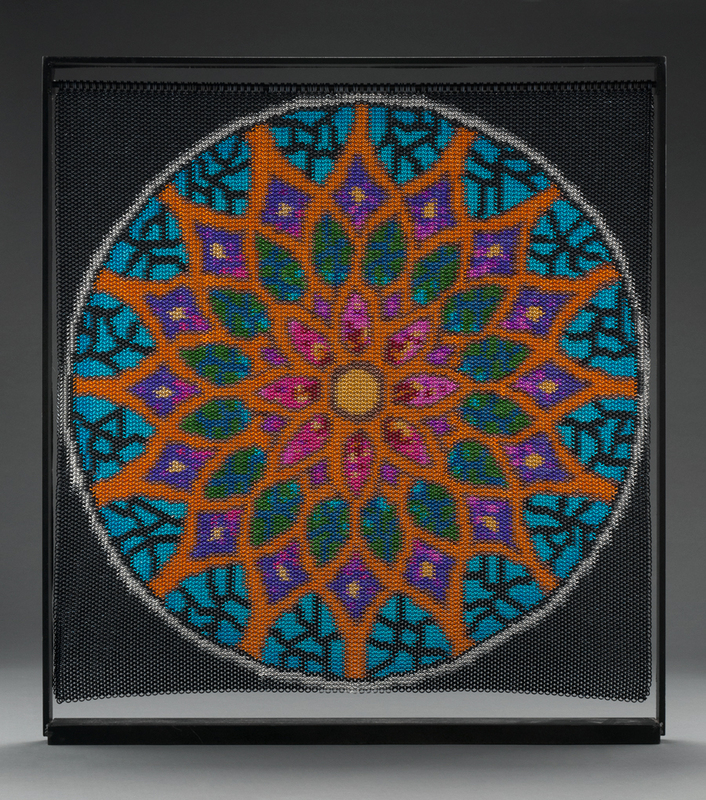 I decided to make the mandala 23″ to allow enough room for a display frame. 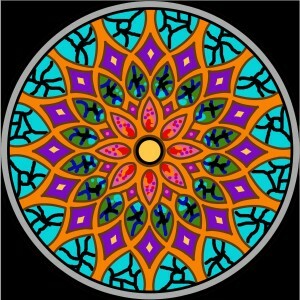 I took to the Internet to try to find a suitable mandala upon which to base my design. I needed to find something that wasn’t too intricate, as my “pixel” size was an F18 ring (18ga Standard Wire Gauge (SWG) with an inner diameter of 5/32″ or approximately 4.0 mm). 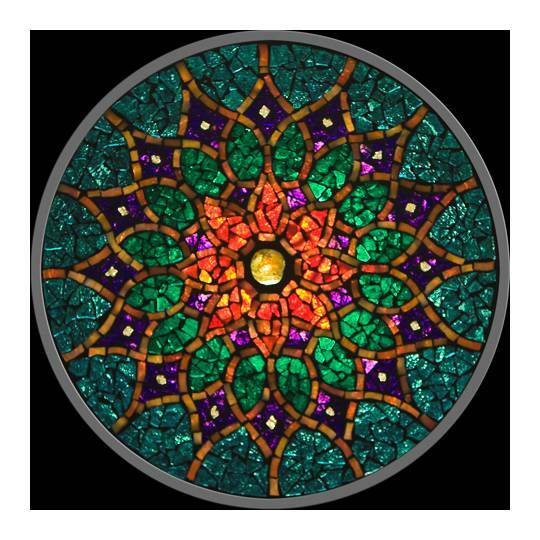 The piece is by David Chidgey Art Glass Mosiaics. He does some amazing work—do check out his website! I contacted Dave to make sure he was OK with me essentially recreating his piece, and he gave me his blessing. Yay! 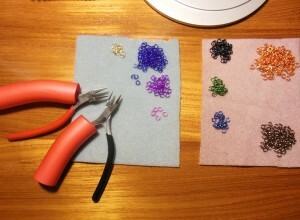 I eventually also added pink and violet “dots” in the purple diamond sections. 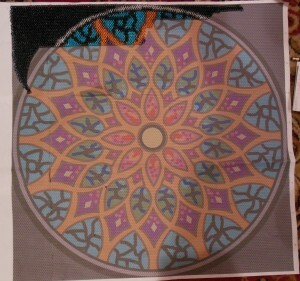 I also shrunk the grey border just a bit so that the colorful part of the mandala would take up more space. Zlosk was kind enough to send me a “blank” rendering of an all-silver-color Euro 4-in-1 in the appropriate “dimensions.” To determine the proper number of rings across and down, I’d made a sample patch a few inches wide/long and extrapolated from there. In Photoshop, I took Zlosk’s blank rendering and increased the contrast to make it less black-heavy when printing (particularly on the black border). 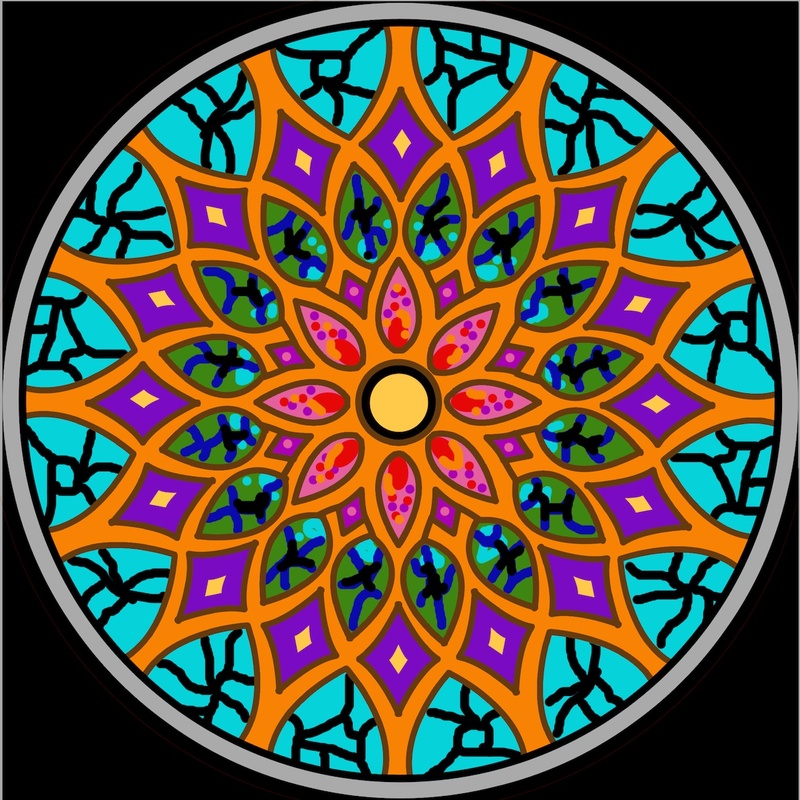 I then took the mandala design and created it as a transparent layer directly over the weave rendering. 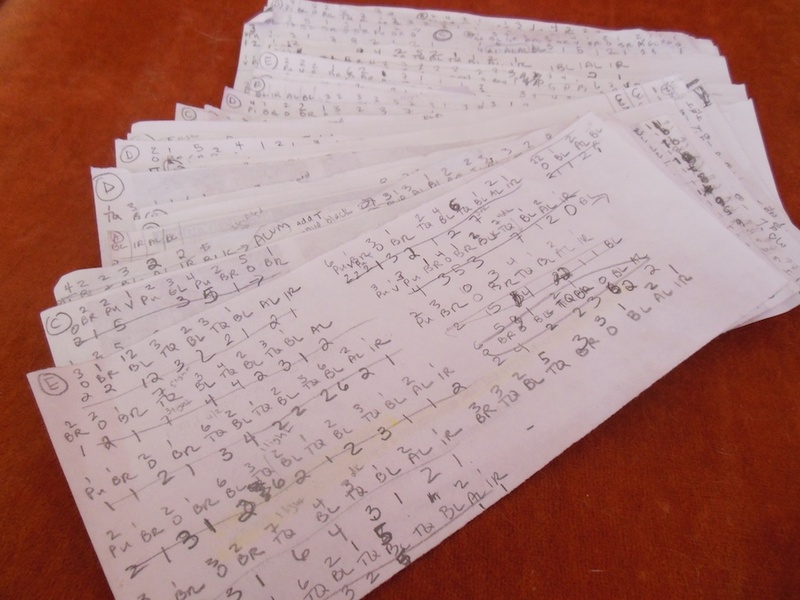 I printed it out in 9 sections, lined them up, taped them together, and started to weave following the print-out. I had to do a bit of guesswork because most of the “rings” on the paper were partially one color and partially another color. And sometimes even 3 colors intersected onto a single ring. So I needed to tweak to figure out which color the ring really should be in order to keep the pattern as fluid as possible. My first major stumbling block in this phase, was that after about 10 hours of weaving, I realized the blank pattern was going to be a couple rings too short. Instead of 88 rings across, it was something like 92. D’oh! I was worried that if I stuck to 88 rings, my piece wouldn’t be as square as I wanted it to be. Rather than completely redo all of this, I just decided to work directly on the paper, as shown below. All of this design prep and futzing took about 14 hours total, not including any weaving. Whew! Once that line was done, I’d repeat for the other columns. And then I’d lay the piece back down on the guide, make sure my work looked OK, and then proceed to plot out the next line. Yes, the work was tedious. And because I had to keep referring back to the color pattern, I couldn’t weave nearly as fast as I normally do. Also, the cats kept attacking the guide; they were probably jealous of all the attention it was getting! 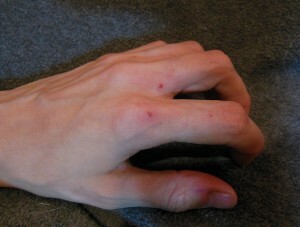 It got nice and holey from their claws by the end of this all. Despite various setbacks and feline distractions, I kept at it for three months. I modified my pliers with a cushy foam grip in order to prevent repetitive stress injury (see below). And I did LOTS of hand and shoulder exercises. Unlike most of my other weaving, I chose to weave these rings without Tool Magic on the pliers. The weave was snug, and to get in that tight space with Tool Magic was going to be challenging. So I wove it without, which meant that I did have to set aside some rings which I scratched while working. 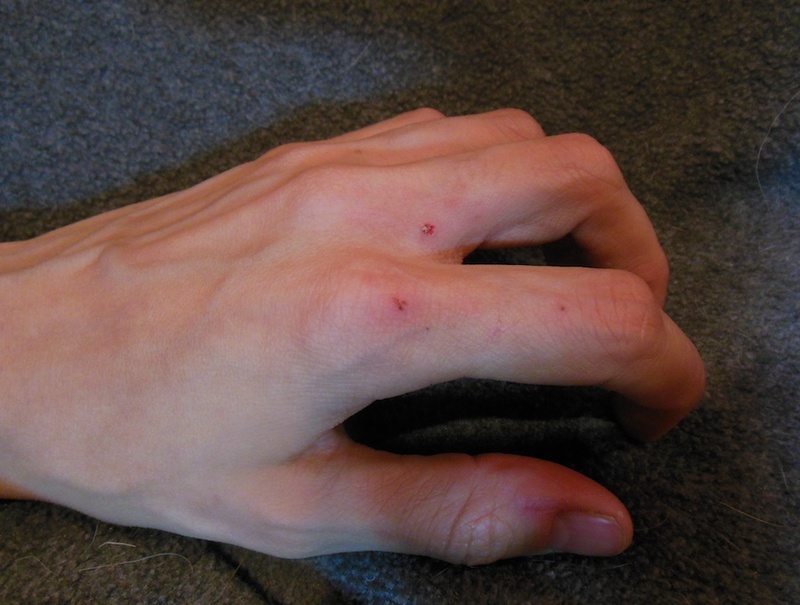 Not to mention the fact that I got a good case of Maillers’ Knuckles (red marks and scabs caused by pliers slipping across the weave and crashing into the knuckles of the opposite hand). The blood was worth it. I adore the final piece. I am happy to report that I won the People’s Choice honor at Bead Dreams 2013! 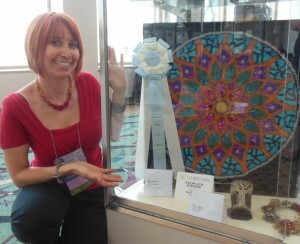 Thank you so much to everyone who voted for the mandala! In this 90-day period, there were only 8 days when I didn’t work on the piece. I was out of town/attending conferences/retreats/unconferences for 5 of those days; 2 days I was just busy with other stuff and couldn’t get to it and on one day I gave myself and my wrists a nice rest. 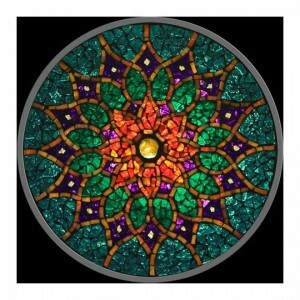 If you liked this post & the mandala, please “like” Rebeca Mojica jewelry on Facebook! 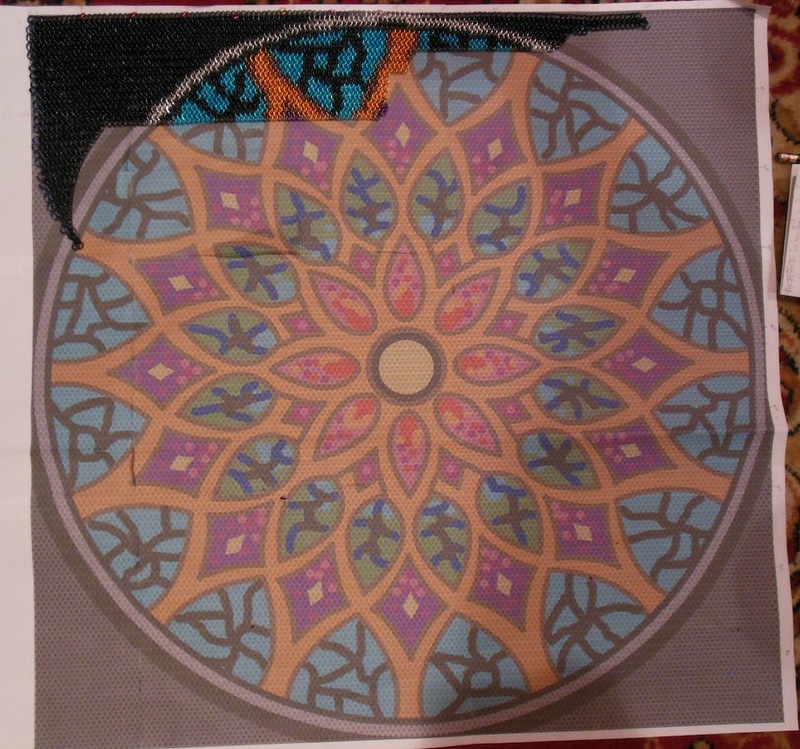 7 Comments on "Chainmaille Mandala: Behind the Scenes of Creating a 27,000-ring Wall Hanging"
I would like to purchase this picture of your mandala. Is this a possibility? Rebecca, the mandala is incredible. Congratulations on winning the competition and also your wonderful accomplishment of translating the design. The largest project I’ve done to date is approx. 3,000 rings for a 8″ x 8″ purse with a cross body strap. Obviously it was only a small fraction of the rings you used for this mandala, but it gives me some appreciation of the effort that went into it…. I bow to your skills and insert applause here. Aww, John, you’re so sweet! I guess it’s obvious how much I love maille, eh? Even when things go wrong, I STILL love what I’m doing. I’m glad I got to witness in person some of the many hours this took to construct. People, you have no idea how difficult this was! You think you do, but you don’t. Whether it was comparing the weave against the pattern, adding rings, or then snipping them right back off with wirecutters (ouch) and starting over, Rebeca was so Zen. So calm. I am a very patient person, but that is a whole different level. Congrats on such a great piece of art, and thanks for sharing some of the details with us! You can absolutely post a link to this, Victoria. I’d be honored!